Secure your most vulnerable opening... Now the power of the ADT Pulse Security is extended to the front door lock. 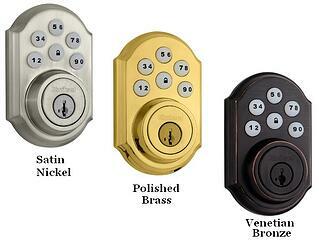 Control your door lock by using Z-Wave enabled Kwikset locks. You must have ADT Pulse Level III monitoring service to add deadbolt smart locks. Price includes installation. Can only be installed when there is an existing independent dead bolt. Existing dead bolt lock must operate smoothly and freely move in and out (does not work with a warped door). "love the automation especially the automatic door locks..."
"I just recently installed ADT Pulse along with a host of home automations. Kyle was absolutely a pleasure to work with. He was very open and honest and answered all my questions with a lot of detail. He was also able to give us an amazing price given the complexity of my installation. When it came down to installation day, Jesse was able to complete the install in a very short amount of time which was great and allowed me to enjoy the system quickly. Now we feel a lot safer and love the automation especially the automatic door locks and outdoor cameras. Very reasonable prices, great service and very professional. I highly recommend these guys."